Frank Swann PI moves through the wild and sometimes dangerous world of 1970s mining-boom-town Perth, and in the law courts of Sydney, Harry Curry rests his case. In Zero at the Bone, the second book in this series, Frank Swann has moved more sideways than on. Working as a PI, he finds himself dragged into the suicide of geologist Max Henderson, whose wife Jennifer enlists Swann’s services to find out the reasons for his death – there is no doubt about the manner of it. The first book in the series, Line of Sight, was based on a true case, but Zero at the Bone heads straight into fictional territory, though still with a loud ring of truth about it. Swann is not just a believable character, he’s also somebody it’s possible to identify with. His methods might be a little unorthodox at times, but there’s something about his love for his wife and daughters that helps to make him sympathetic. His wife Marion plays only a small part in the action of this book, but she’s a strong character nonetheless, and you have to like the dry, caustic way she has of dealing with the inevitabilities of Swann’s excesses. The dawn chorus of zebra finches and budgerigars in the curare chirruped in waves that lofted and fell. The track cut through a low rise and there was Wulga Rock in the distance, a hulking monolith of crimson granite near a well-treed riverbed. The view was clear to the horizon, the land shrouded in blue cold. Throughout this novel there are echoes back to earlier events, although not enough to make it essential for readers to have read the books in sequence. Zero at the Bone delivers on a whole series of levels. There’s puzzle solving, a bit of good old-fashioned detecting, a great sense of place and time and a solid dose of common sense at the heart of much of the investigation. There’s also a resolution that plays out in a rather surprising but somehow completely apt manner. The central character is an attractive lone wolf, with a strong Australian identity, and the time frame of the late 1970s is perfectly drawn. All in all there’s a great deal to like about Zero at the Bone. It’s not really surprising that Stuart Littlemore, well-known legal counsel, would attempt Australia’s answer to Rumpole of the Bailey in a series based on cases where the Defence (in the guise of Harry Curry) rides to victory on the back of some cunning goings-on in the trial courts of NSW. However Curry’s partner Arabella Engineer is no ‘She Who Must Be Obeyed’ and certainly not one to worry about the state of the chops as Harry quietly drinks his Chateau Cardboard in celebration of another stunning victory. Instead, Engineer stands firmly in her own place in court, albeit guided in strategy by Curry as his own legal career veers from minor infraction to bush-based defending from the farm. This final instalment adds impending parenthood, the complicated partnership-versus-marriage question of the modern couple and the concomitant complications of a very traditional potential mother-in-law. All of which Curry must ‘win’ while simultaneously holding up his end in South Coast courtrooms. In a storyline that’s fleshed out with lots of small victories and cases in which Arabella also triumphs, the central focus of this book is the case of a security guard who shot a ride-along colleague. Obviously the outcome depends on whether or not Curry can prove that the victim, now wheelchair-bound, is lying about the actual events of the night in question. While a lot of evidence-putting and cross-examining goes on, there’s nothing baffling or overly ‘legal’ for the lay reader to deal with and the resolution works out as expected, while cleverly presented. The point of this series isn’t immediately obvious. It’s not crime fiction in the sense that a crime is committed and an investigation ensues. It’s not even legal crime fiction where the case hinges on the prosecutor or the defence counsel proving/disproving/establishing a case. While there is the personal element, it’s also not necessarily a series about the developing relationship of two people. Rather, this is a series about how the Defence always triumphs because of either the incompetence of the prosecutor or the judge, or through some clever interpretation of whatever law is involved. Perhaps because it’s not necessarily trying to be anything in particular it’s quite good fun, in a self-congratulatory, aren’t-we-clever sort of a way, as long as the tone and the style don’t get up your nose – which readers will be able to gauge from about the second paragraph. But don’t expect to find Rumpole and Hilda lurking under the covers. It might come from a similar vine, but it’s a very different fruit. 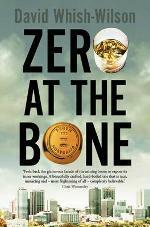 You can buy Zero at the Bone from Booktopia here or from Abbey’s here. If you would like to listen to a Books and Arts interview with David Whish-Wilson about the book, click here. You can buy Harry Curry, Rats and Mice from Abbey’s here or from Booktopia here. To see if these books are available from Newtown Library, click here.